Positive and Negative Fifteen Volts DC at up to 600mA each supply. Twelve power connection wiring/connector areas (4 x 0.1"). 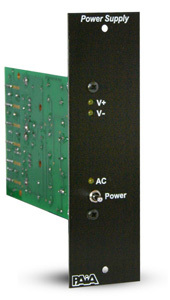 Includes single-space FR-7 FracRak format front-panel. Less US-type 120VAC to 16.5VAC transformer.